Now that it’s Katsucon preparation week I’ll be posting one of my favorite photos that I took last year at Katsucon every day! 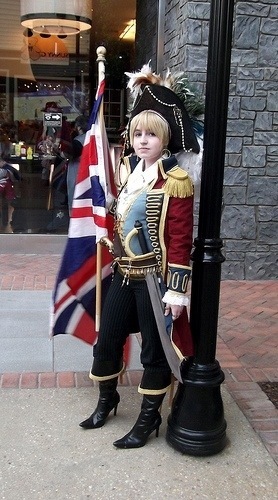 This photo is from the anime Hetalia. Hetalia: Axis Powers is a Japanese webcomic, later adapted as a manga and an anime series, by Hidekazu Himaruya. The series presents an allegorical trivialisation of political and historic events, particularly of the World War II era, in which the various countries are represented by stereotyped anthropomorphic characters. The main characters are the countries which made up the Axis powers and Allies of World War II, namely Italy, Germany, Japan, United States, England, France, Russia and China. It’s a cute little show that has created some really cool cosplaying at the various anime conventions.